Absorb the fantastic, fun and fairy-tale Futuroscope atmosphere with over 25 original experiences waiting for you in our stunning attraction theatres, as heart-thumping adventures, outrageous thrills, mind-blowing journeys, the fairy-tale evening show and fascinating attractions deliver delights to suit all tastes and ages! New surprises in 2018, including Thomas Pesquet Adventure a totally immersive space adventure in the footsteps of the French astronaut and from April 2018, Sebastien Loeb Racing Xperience ! Settle into your bucket seat next to the 9-time World Rally Driver’s Champion, put on your virtual reality helmet and experience some hard and fast sports car action! A break with one overnight stay at Futuroscope is a great way to see the attractions at your leisure and enjoy the superb evening show. 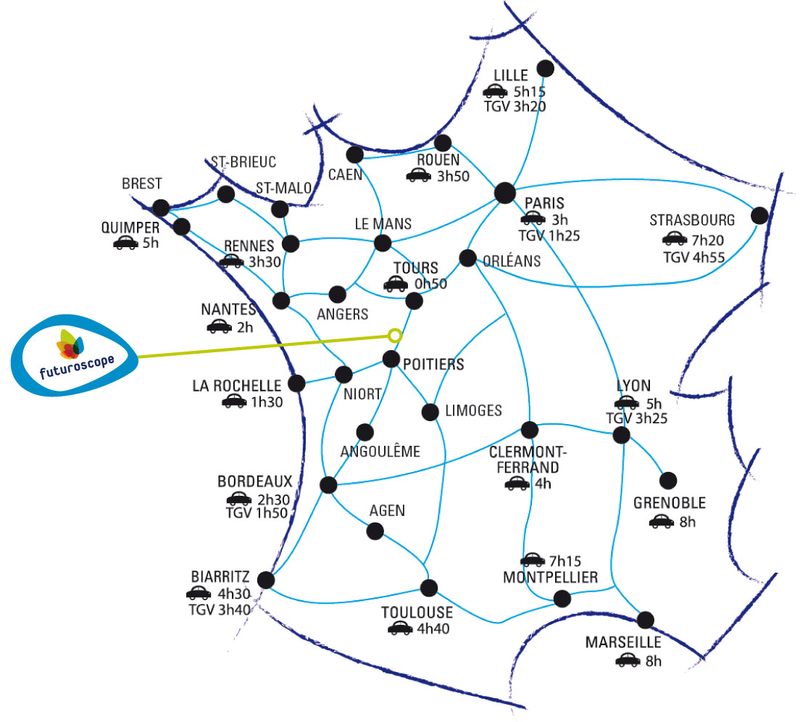 Futuroscope has selected 14 hotels within easy walking distance so that you can take a break during your fun-filled day and turn in quickly after the evening show. Remember to treat your tastebuds, too! Discover Futuroscope’s 7 theme restaurants and large choice of takeaway outlets, where you will enjoy the high-quality food you fancy at a price you like, all prepared on-site by our chefs. Exit 28 on the A10 motorway (Paris-Bordeaux) is 2 minutes from the main entrance of Parc du Futuroscope. The Futuroscope-TGV station takes you directly into the park.